, a celebrated artist, called Paul Veronese, the great master of what is called the ornamental style, was born at Verona in 1530, and was the disciple of Antonio adile. When young, in concurrence with Batista del Moro, Domenico Brusasorci, and Paol Farinato, he painted at the summons of cardinal Ercole Gonzaga, in the cathedral of Mantua, and left no doubt of his superiority in the. contest. 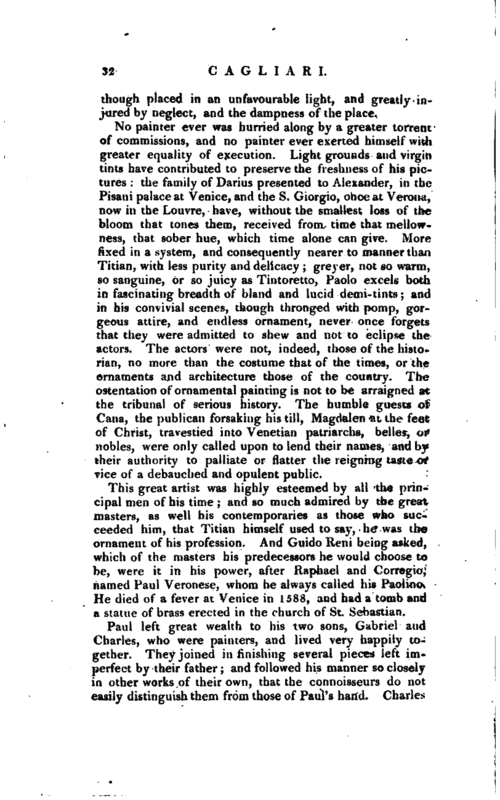 He then went to Venice, and with the procurator Grimani to Rome, where, from the frescos of M. Angelo and Raffael, he acquired the idea of that breadth which distinguishes him in all his allegorical and mythologic pictures; and though the simplicity inseparable from real grandeur vras not a principle to be courted by him who aimed at captivating the debauched Venetian eye, he gave proofs, that, if he did not adopt, he had a sense for its beauties. The Apotheosis of Venice in the ducal palace, in magnificence of combination, loftiness, splendor, variety, offers in one picture the principles and the elemental beauties of his style. It was, however, less to this work, than to his Cene, or convivial compositions, that Paolo owed his celebrity. He painted four at Venice, for four refectories of convents, all of enormous dimensions and equal copiousness of invention. The first, with the Nuptials of Cana, once in the refectory of*St. Giorgio Maggiore, now in the Louvre, and known by numerous copies, is thirty palms long, comprizes 130 figures, with a number of distinguished portraits; and yet was painted, says Lanzi, for no more than ninety ducats. The second, better preserved, was painted for the convent of S. Giovanni and Paolo, and represents the call of St. Matthew; it is chiefly praised for the character of the heads, which Ricci copied for his studies at an advanced age. The third, at St. Sebastian, is the Feast of Simon, which is likewise the subject of the fourth, painted for the refectory o/ the Servi, but sent to Lewis XIV. and placed at Versailles. This, perhaps, is the master-piece of the four, | though placed in an unfavourable light, and greatly injured by neglect, and the dampness of the place. No painter ever was hurried along by a greater torrent of commissions, and no painter ever exerted himself with greater equality of execution. Light grounds and virgin tints have contributed to preserve the freshness of his pictures: the family of Darius presented to Alexander, in the Pisani palace at Venice, and the S. Giorgio, once at Verona, now in the Louvre, have, without the smallest loss of the bloom that tones them, received from time that mellowness, that sober hue, which time alone can give. 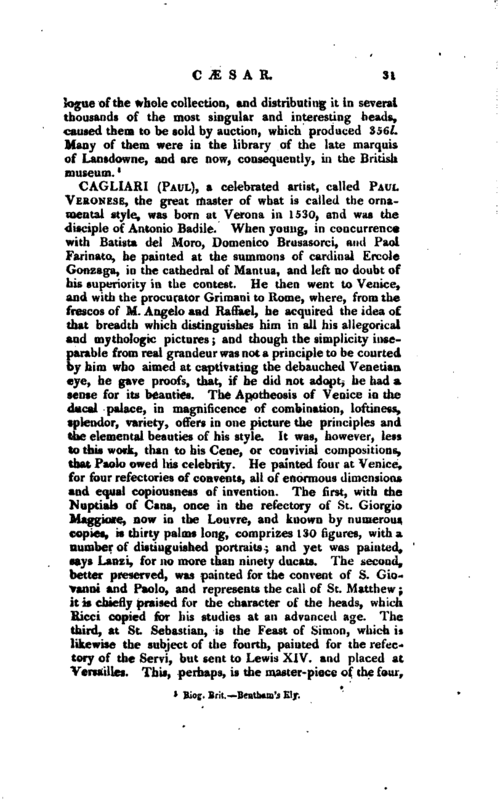 More fixed in a system, and consequently nearer to manner than Titian, with less purity and delicacy; greyer, not so warm, so sanguine, or so juicy as Tintoretto, Paolo excels both in fascinating breadth of bland and lucid demi-tints; and in his convivial scenes, though thronged with pomp, gorgeous attire, and endless ornament, never once forgets that they were admitted to shew and not to eclipse the actors. The actors were not, indeed, those of the historian, no more than the costume that of the times, or the ornaments and architecture those of the country. The ostentation of ornamental painting is not to be arraigned at the tribunal of serious history. The humble guests of Cana, the publican forsaking his till, Magdalen at the feet of Christ, travestied into Venetian patriarchs, belles, or nobles, were only called upon to lend their names, and by their authority to palliate or flatter the reigning taste or vice of a debauched and opulent public. This great artist was highly esteemed by all the principal men of his time; and so much admired by the great masters, as well his contemporaries as those who succeeded him, that Titian himself used to say, he was the ornament of his profession. And Guido Reni being asked, which of the masters his predecessors he would choose to be, were it in his power, after Raphael and Corregio, named Paul Veronese, whom he always called his Paolino. He died of a fever at Venice in 1588, and had a tomb and a statue of brass erected in the church of St. Sebastian. Paul left great wealth to his two sons, Gabriel and Charles, who were painters, and lived very happily together. They joined in finishing several pieces left imperfect by their father; and followed his manner so closely in other works of their own, that the connoisseurs do not easily distinguish them from those of Paul’s hand. Charles | had a genius for painting, and at eighteen years of age had done some excellent pieces. It is thought, if he had lived, that he would have exceeded his father; but contracting an imposthume in his breast, by applying too intensely to his profession, he died of it in 1596, when he was only twenty-six years old. 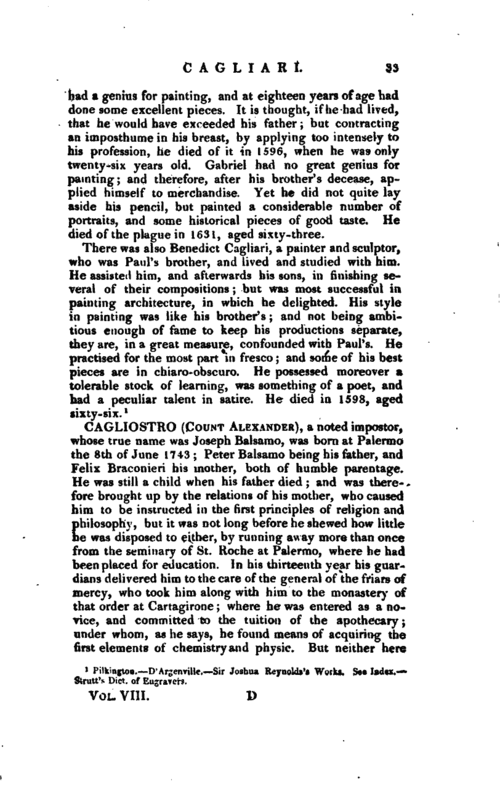 Gabriel had no great genius for painting; and therefore, after his brother’s decease, applied himself to merchandise. Yet he did not quite lay aside his pencil, but painted a considerable number of portraits, and some historical pieces of good taste. He died of the plague in 1631, aged sixty-three. 1 Pilkington. D’Argenville. Sir Joshua Reynolds’s Works. See Index, —Strutt’s Dict. of Engrarers.